Product #5852 | SKU C544L | 0.0 (no ratings yet) Thanks for your rating! 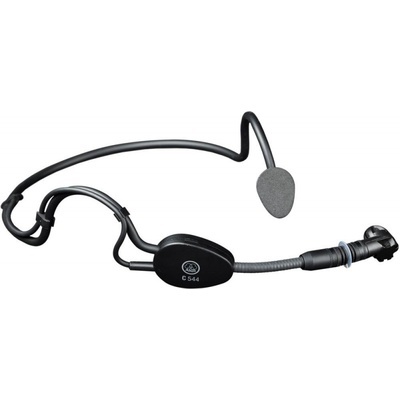 The AKG C544L Headworn Cardioid Microphone is a miniature, moisture resistant microphone well suited for fitness instruction, presentations and any application where a quality unobtrusive head-worn microphone is needed. The headband is mounted around the back of the neck for a comfortable, low-profile fit. The highly sensitive cardioid capsule yields excellent feedback and noise rejection at the off-axis sections, and its moisture barrier protects against humidity, sweat, makeup and other moisture. The output cable features a mini 3-pin XLR connection for use with an AKG bodypack transmitter or power supply (sold separately).